Turn IPv6 on and keep it on! 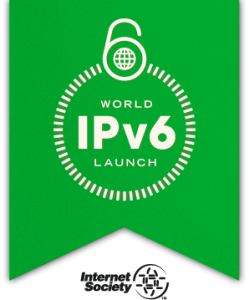 The Internet Society has declared June 6th 2012 as the World IPv6 Launch day. Like last year’s World IPv6 Day this event is focused on the web. While last year was a test for one day, this event is focused on turning IPv6 on and keeping it activated. Many large and small web sites have joined the effort and more are signing up every day. Turn IPv6 on – and keep it activated on your web site! The goal is to turn on dual stack support on web sites, which also requires support for IPv6 access in DNS and many support systems. Edvina’s blog IPv6friday.org describes what you need to do in order to support IPv6 in your systems. We hope that this project can also add some momentum for other protocols than HTTP. Realtime protocols like SIP and XMPP need IPv6 support as well, and especially solutions for dual stack environments. SIP was defined for both IPv4 and IPv6 from start, but there wasn’t much consideration on dual stack deployment. The problems that have been handled by web browsers (called Happy Eyeballs) needs to be applied to almost all other protocols. Edvina is working on this, from doing testing to show the issues at SIPit 29 in Monaco 2011 to working with the SIP Forum IPv6 project. Need help with your IPv6 project? Count on us! In Edvina and our partners we have years of experience of TCP/IP networking and have focused on building experience and detailed knowledge about IPv6 during the last couple of years. Contact us about your IPv6 project today!